A direct pupil of Rembrandt was Gabriel Metsu (1630-1667), who received his first instruction from Dou, and was a close friend of Jan Steen. When he was twenty he had already for two years been admitted to the Guild of his native Leyden. Then he moved to Amsterdam, where he lived during the remainder of his life. He came at once under Rembrandt's influence, as may be seen from the great master's decided impress upon Metsu's earlier works. We must have observed how little is known of the private life of most of these painters. Only birth, death, and marriage registers, and the dates an their paintings give us often the only information obtainable. All we know of Metsu is that he married in Amsterdam in 1658, and that he died there at the early age of 37. His work shows him to have been an impressionable character. One or the other of his contemporaries is generally to be recognized in his scenes, of peasant life, his few portraits, and his little pictures of life in the parlours or boudoirs of the wealthy class of society. They are all reminiscent of like compositions by van Ostade, Terborch, Jan Steen, and a host of others for Metsu lacked the power of individual observation. Notwithstanding this, possibly unconscious, imitation, his work possesses masterly characteristics, the inspiration of the truest feeling, and the spirit of perfect serenity. Especially as a draughtsman he is the most accomplished of the Dutch genre painters, while his technic is his own, rivalling Dou's in finish, but invariably lighter and freer in handling the "grand style" on a small scale. He is also remarkable in the exquisite delicacy wherewith he portrays the play of features on an otherwise placid, even phlegmatic countenance, so that his personages, with all their serenity and repose, still display the human emotion which makes sympathetic appeal. Although I have suggested a resemblance between Metsu's compositions and those of others, it must not be forgotten that if he borrowed he repaid with interest. For if we might find Jan Steen's spirit in his "Intruder," it is Jan Steen wholly devoid of coarseness. If we might suppose Terborch to have suggested his picture of "An Officer and a Young Lady," it is Terborch animated with a spirit he himself very rarely displays. And Metsu's single half-length types, which remind us so vividly of Gerard Dou, are more elevated, more intellectual, more spirituelle, as may be seen in those little panels in the Ryksmuseum, "The Old Taper" and "An Old Woman Reading." The portrait of an "Old Woman", one of Metsu's few life-size portraits, must also be considered as masterly a production as can be found from any of the portrait painters of the 17th century, Rembrandt and Hals excepted. 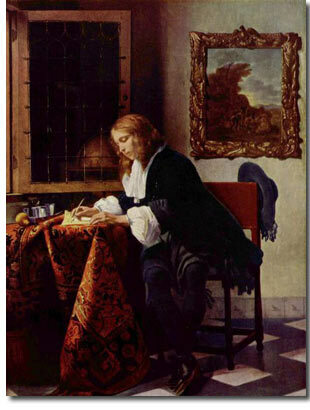 After all is said, Metsu must deservedly be placed above the second rank of Dutch artists. He could not paint light as de Hooch or Vermeer, nor movement as Jan Steen, nor the refinement of breeding with Terborch, but in the unity of design and execution, and in consummate mastery of handling, he was equal to the best.